MS4Press.ru has written an article called “5 new opportunities with IE9” (translated title) that did include the following screenshot. Obviously, mentioned post has been removed since then and the higher resolution image is not yet available. Before the beta release of the new Internet Explorer browser in September remained very short. And to warm up the expectations of those who wait, and of interest to those who still do not know about what unique qualities will have IE9 we decided to summarize all that has been said about the new Microsoft browser, and add something new. HTML5. Internet Explorer was created in September with the expectation of support for modern language version of HTML5. In an effort to give developers the ability to use the Internet the same layout we have added many new features based on HTML5, CSS3, DOM L2 and L3, SVG, ECMAScript5, etc., which require hardware acceleration and up to standard. Furthermore, we have transferred a lot of new tests for HTML5, CSS3 and DOM at the W3C, and are actively participating in standardization work. New features in HTML5 with hardware acceleration support elements include video and audio, which provides playback of embedded video and audio content without having to install add-ins. Canvas element provides a dynamic construction of graphic images by means of hardware acceleration of Windows and graphics card. Several new CSS3 modules extend the boundaries of creativity, web designers, and the API DOM means greater flexibility for developers of sites. Focusing on the web. The new navigation bar Internet Explorer 9 simplifies perception websites. Frame your browser is not overloaded with navigation elements, and compared with other browsers leave more space for the site. Tools Navigation Internet Explorer 9 created in view of frequently used functions and also simplified. Button to return to the previous page has more address bar and search box integrated into one address bar that protects the user’s personal data, as many menus that are present in earlier versions of Internet Explorer, merged into one. The user now sees only what is necessary for navigation. Retired Sites. For fixed sites, you can proceed directly from the taskbar, Windows, without having to open Internet Explorer. Secure site can be a few seconds: click the pins in the address bar or click the site in a new tab and drag it to taskbar. That’s it. If the site is fixed, for it shows his badge, separate from Internet Explorer. Now, from your favorite site separates only one click. This feature brings into focus the site, and not the browser. 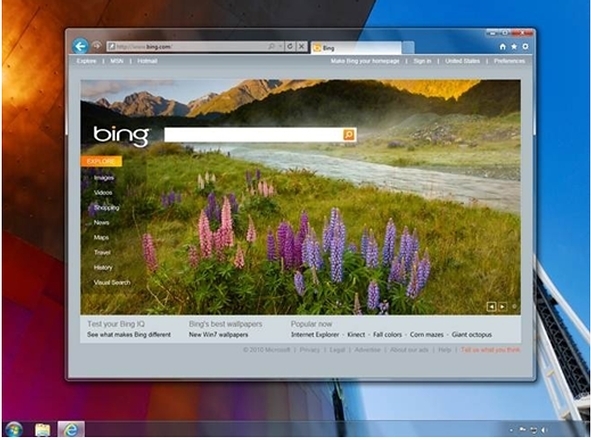 Anchored sites are seamlessly integrated into a navigation system Windows 7. For every such site has a preview on the taskbar and a list of transition. Thus, the work of such sites – as simple and familiar, as with other applications Windows. Quick release tabs and Windows Aero Snap. Often, for the task have to open several Web pages or windows. Advanced tab in conjunction with the function of the Windows Aero ® Snap can quickly display just two sites or two pages. To do this, simply drag the page to different edges of the screen, and the sites are displayed next to each other. Reproduction of the contents of the Web sites and video with no breaks. UI looks nice though but don’t get excited, this interface still has some flaws. Either, this is an alpha/beta build or it’s yet another fake image. I was going to point out some of the obvious flaw in that UI, but then I thought best. I don’t know what else to say!! Thanks. Actually, I’m fan of all brand browsers (Except IE7). Somehow I didn’t like Ie7. But look at the difference between IE 8 and forcoming IE 9, thats huge. I think this is the only version of browser in this world which has this huge change from the previous version. Thats why I like IE 9 more – Mozilla is achieving what it want. Next I like more is Opera browser, that is where all the other browser copies the few killer ideas from. Firefox, Chrome & Safari are at the same level for me. I don’t use any add-ons, I use almost plain browser expects few like flash,silverlight & divx. Good except for one detail. But you can already download it and see what it’s going to look like here http://ie.microsoft.com/testdrive/ !!! or am I missing something? If they sync tab thumbnails with browser gui, maybe i will use it then. So far just Firefox 4 is doing right. Yes, thats the good idea. If they have proper windows 7 integration, you get the tab preview in the taskbar itself. Do you mean the feature where thumbnails of every single tab in a browser appear when you place the cursor over a window in Windows 7? This is what the behaviour in IE8 + Win7. Have to wait & see whether it is the same for Ie 9. If it not working for you, probably it is disabled for you. Here is the link on how it is disabled. You don’t understand i guess, thumbnails from Windows 7 are OK but when you use them they are not 100% content sync with browser, it just shows some screenshot of that page over another page, check the window title if it change it, now you will see the problem. is it ? Thanks for educating me. But I never noticed it. I have been using the Win7 thumbnails for long and I’m happy with it. Now onwards I will have eye on this. Browser must be full screen to see the problem better, open couple tabs and look for changes while using the thumbnails from Windows 7. The funny thing is that IE it self is doing that. If still can’t see the problem try the latest Firefox 4 beta 4, only there is working properly.